This began on March 25, 1995. A little later (May 1, 1995), an Invitation To The Patterns List caused an increase in participation. 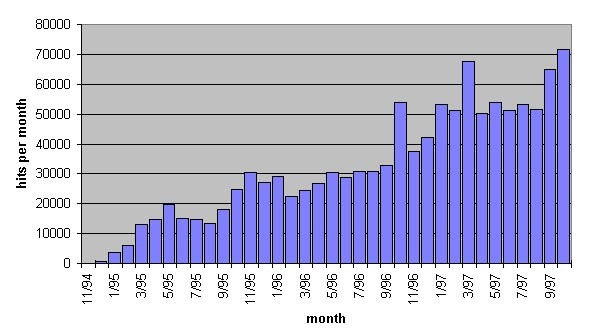 Growth has continued since then, to the point where the average number of new pages ranges between 5 and 12 per day. Wards Wiki Tenth Anniversary occurred on March 25, 2005. At that time, we had about 30690 pages. This is the first ever wiki site, founded as an automated supplement to the Portland Pattern Repository. The site was immediately popular within the pattern community, largely due to the newness of the Internet and a good slate of Invited Authors. The site was, and remains, dedicated to People Projects And Patterns. I created the site and the Wiki Wiki Web machinery that operates it. I chose wiki-wiki as an alliterative substitute for quick and thereby avoided naming this stuff quick-web. Read more about etymology here: c2.com. An early page, Wiki Wiki Hyper Card, traces wiki ideas back to a Hyper Card stack I wrote in the late 80's. This same stack, by the way, spawned Crc Cards. I've reconstructed the Wiki Design Principles I applied at the time. Read more on the name here: c2.com. Patrick Mueller wrote probably the first Wiki Wiki Clone, choosing the Rexx Language as a convenient vehicle for a night's work. I soon wrote a version of wiki that could host its own source code and announced Wiki Wiki Goes Public. Rather than fold changes back into my editable version, implementers chose to distribute their modifications on their own sites and boast of the many features they had added, accepting raw HTML being the most common one. It has been claimed by some that the ideas that led to the Wiki concept have their origins (see: Wiki Wiki Origin) in the ZOG database system effort, first materialized at Carnegie-Mellon University in 1972. Landmark changes to the Wiki script - approximate dates; please put correct dates if you know them. Ok. But when does Recent Changes function appear? From the beginning, wiki was intended to index itself. Or, more correctly, wiki visitors were supposed to evolve into Volunteer Housekeepers. This is one reason that Recent Changes has never automatically pruned itself. A variety of indexing innovations have been introduced and maintained by the community. I recently stumbled across this early description of the c2.com server with hit statistics for the first three years of operation. The Wiki Mind Wipe, followed by the careful deletions of the "Wiki Reductionists" for one morning in Europe (the time lag with the West Coast being very relevant to the ensuing hyper-muddle), created significant controversy which divided several veteran wiki authors; the disputes have not been fully resolved, but have led to a widespread disgust of Wiki On Wiki topics. In 1995, I started keeping wiki pages in a directory that let them show up in the disk-usage (du) statistics that I collected about once a year. This table shows when I made the record and the number of 1k blocks consumed by wiki pages on that date. I have compressed logs around somewhere but can't put my fingers on them. I have located some early mail that indicates wiki went public in 3/95. Here is a graph I made when I still counted page hits. Proponents of Extreme Programming showed up on the Portland Pattern Repository site and started talking about Extreme Programming, what it is, and how to do it. XP advocates seemed to be talking about XP at every possible opportunity and seemingly on every page with content the least bit related to software development. This annoyed a number people who were here to discuss patterns, leading to the tag Xp Free Zone, as a request not to talk about Extreme Programming on that page. It was difficult to pick out the Design Patterns discussion on Recent Changes, because most of the activity was related to Extreme Programming. Eventually, most of the Design Patterns people left, to discuss patterns in a "quieter" environment, and people started referring to this site as Wards Wiki instead of the Portland Pattern Repository. What's a Recent Changes Junkie to do? There are many changes, so it's hard to tell which ones are "worth reading". Was a change just a minor adjustment of spelling, punctuation, or correction of web links? Or was it the addition of some interesting new content? Some good souls started taking Recent Changes, annotating each line with a brief description of what had changed on the page, and posting this to the Change Summary page. Good idea, but remarkably time-consuming. It didn't take long for this practice to peter out, because it was simply too much work. This Wiki added the "Minor Edit/Recent Edits" feature to reduce the Recent Changes clutter. Other Wiki sites have a feature where the poster, can enter a line of descriptive text when saving changes to a page, which puts "Change Summary" data right on their "Recent Changes" pages. Proponents of Chatter For The Sake Of Chatter showed up on Wards Wiki and started talking about themselves, what wiki is, and commenting on every page in order to leave their signature. These newcomers got in lots of verbose arguments and Edit Wars with the regulars, and with each other. This annoyed a number programmers and XP advocates who were here to discuss programming. It was difficult to pick out the Programming and XP discussion on Recent Changes, because most of the activity was related to Chatter For The Sake Of Chatter. Eventually, most of the programmers left, to discuss programming in a "quieter" environment. To set the record straight: major XP advocates drifted away long before the 2004-2005 season. And the kind of problems that happened in 2004-2005 have been with wiki before, arguably at a lower intensity but with similar effects. Wiki seems to repeat its history. Out of curiosity, I tried the Wiki Archive to check revisions of common C2 pages (e.g., Front Page), and found in most instances there are no history files between 1997 and 2001. But I did find Kent Beck had a revision in 2000. Do we know what the first ever wiki page was? Is there any way to tell at this point? Does it still exist? Some of the most popular websites and open source projects use the wiki system. When did wikis introduce the true groups function and start tracking the movement of a user through different articles (keep knowledge of the user inserting/editing)? Is there any more recent data of innovations or the number of users?